Nasal bleeding is a very common problem. 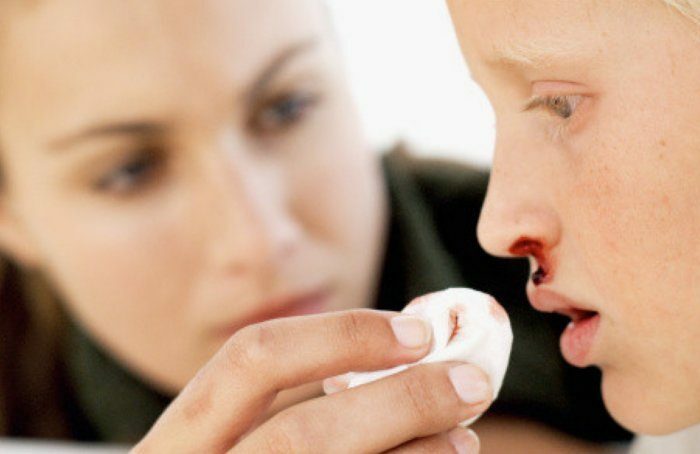 The blood from the nose comes in the condition when the inner layer of the nose is injured or dry. As a result, bleeding from the small blood vessels of the nose begins. In this article, I will tell you fastest way to stop nosebleed. Take few ice cubes wrap them in a thin cloth or towel. Now sit in upright position. Now titl your head back. Apply the ice cubes covered in towel across the bridge of your nose for 5-10 minutes. Repeat this process as needed. This process will stop the bleeding within a few minutes. Take two small cotton ball. Soak them in apple cider vinegar and place them lightly into both nostrils. Wait for 5-10 minutes and then take them out. Cayenne is also an effective home remedy to stop nosebleed. Add 1 tbsp of cayenne powder into one cup of warm water. Now drink this water. It will stop nosebleed in few minutes. Cut 1 small onion into thick slices. Now press one slice under your nose and inhale the fumes. The bleeding will stop within minutes. Put few drops of coriander oil onto the inner nose lining and soon the bleeding will stop. You can also use fresh coriander juice. Mix a pinch of salt in half cup of water. Pour few drops of this solution into your nostrils. You can also use an over the counter saline nasal spray for this purpose. Reapply it 2 to 3 times every day till the irritation is cured.